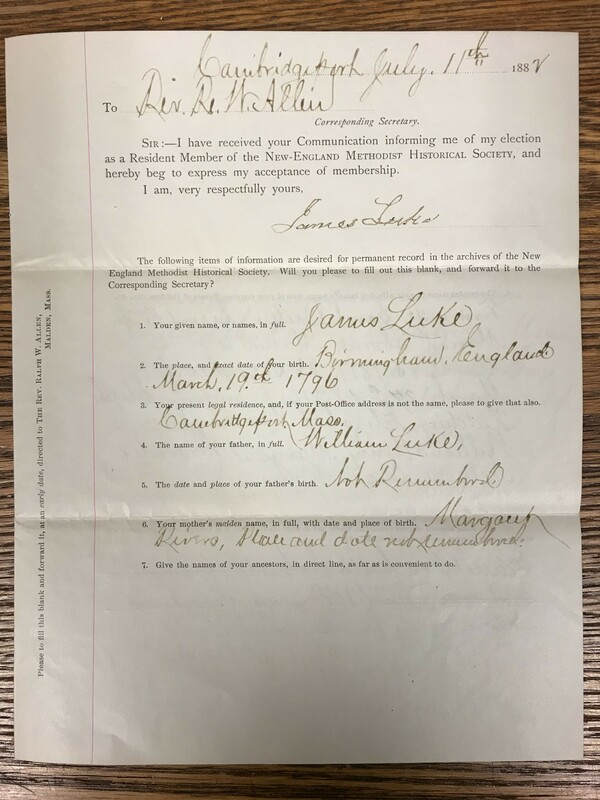 James was a prominent citizen in both Cambridge and Wilbraham, Massachusetts, so I have been able to find information about him in a number of publications, and learned that he was one of the founding members of the Harvard Street Methodist Episcopal Church in Cambridge. Further research revealed that the records of that church are now kept at the library of the Boston University School of Theology. Last month I was finally able to get to Boston to review the records while visiting family in Massachusetts. My expectations were that I might find mention of James and other members of the Luke family, but that any major revelations might have to wait until I manage to get to Birmingham someday. Before my trip, I contacted the archivist at the School of Theology library to make sure that the church records would be accessible on the day of my visit. Advance planning paid off because my visit coincided with the end of semester and final exams for students, and the archivist really had her hands full. Because I was visiting from out of town, she went out of her way to be very accommodating and made sure to pull the records I needed and have them ready for me when I arrived. The first record I looked at was genealogical gold. The first record I looked at was genealogical gold. 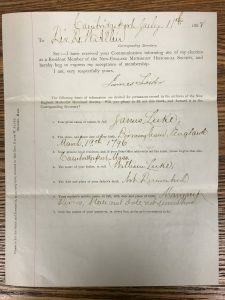 It was James Luke’s four-page application regarding his election as a Resident Member of the New England Methodist Historical Society. 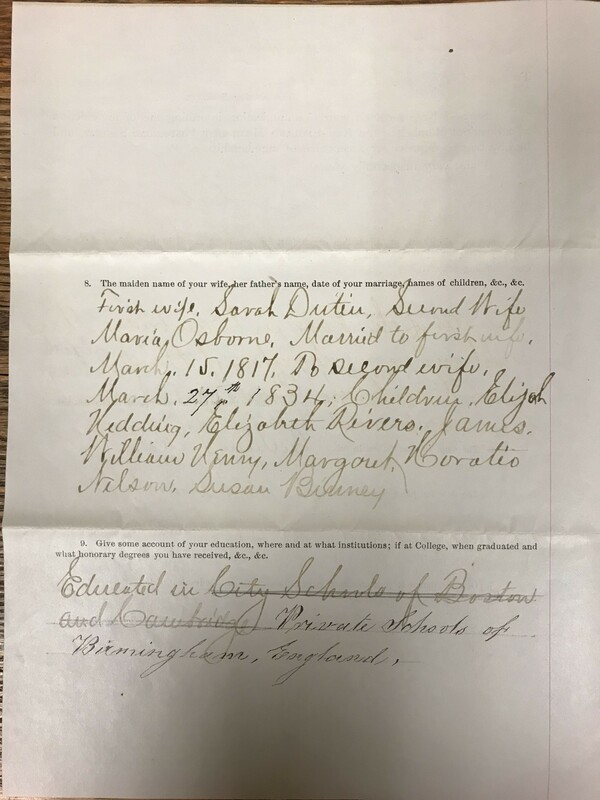 The very first page listed his name, date and place of birth, father’s name, and … his mother’s maiden name! She was Margaret Rivers. Unfortunately both his parents’ dates and places of birth are listed as “not remembered,” but with a maiden name I’m hoping it won’t be long before some of the other pieces fall into place. I went straight to FindMyPast.com with this new name, but have not yet been able to find any new information. I had previously found a William Luke married to a Margaret Adcock in Birmingham and they looked to be about the right age, but could find no records establishing that they could be the parents of James Luke. 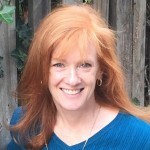 I have to consider the possibility that Margaret Adcock and Margaret Rivers could be the same person, with one surname being her birth name and the other surname being that of a first husband. The new record formed a nice crack in my brick wall but I’ll definitely need more research to break all the way through. 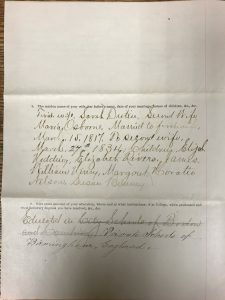 The second page of the church record contained additional important information. It confirmed James’ two marriages and listed the names of his children. Four of the children’s names were very familiar to me, but it contained two brand new names. I found that one of those two children died at 11 months of age, but I have found no records yet pertaining to the second child. This page also states that James was educated in “Private Schools of Birmingham, England,” providing yet another avenue of research. Page 3 of the church record confirmed the positions he held in the City of Cambridge: Overseer of the Poor, Secretary of the Board of Engineers, and Principal Assessor. Page 4 confirmed his occupation. He was a carpenter and builder until age 30, then was in the lumber business for 10 years. It further confirmed that he lived in Wilbraham, Massachusetts for fifteen years, where he was Treasurer of the Wesleyan Academy for one year and Chairman of their Board of Trustees for fifteen years. With all those public and professional associations, I have to believe that there is a photo of James Luke out there somewhere. So on my next trip to Massachusetts, I’m hoping to pay a visit to the Cambridge Historical Society, being sure to work with the Historical Society in advance to make sure I’m able to access and review all pertinent records. Patty: these exciting finds give me hope for some of my brick walls and reinforce the importance of local, obscure repositories that don’t (and may never) have digitized records. One suggestion: try the archives of the academy in Wilbraham. I’m pretty sure that the Wesleyan Academy there became Wilbraham Academy and later merged with a nearby school to become Wilbraham and Monson Academy. Contact them about searching their archives for more details. Great to discover something like this! Wish you the best in finding portrait – seems likely there would be one.